Parfum arabesc unisex ce prezinta note florale, paciuli, sofran, lemn de santal, ambra si vetiver. Mukhallath Khalis - parfum concentrat pe baza de ulei, nu contine alcool si confera persistenta indelungata. Sticla este prevazuta cu sistem roll-on sau cu un betisor de plastic in interior pentru o aplicare cat mai usoara. Mukhallath Khalis – purely for you. An enchanting scent formed by the seamless fusion of florals and soft Saffron. The base of Amber, Patchouli & Vetiver create a creamy, earthy façade – signing off this oriental treat with warmth & sensuality. 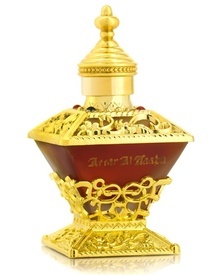 This perfume comes in a beautiful, patterned bottle complete with a branded Al Haramain pouch.